Whether you need a quick snack or a full meal, LU Dining has you covered! A buffet-style food court with a fresh assortment of delicious, healthy meal options for breakfast, lunch, and dinner. Located in the Food Court at the Setzer Student Center. Chicken sandwiches,waffle fries, nuggets, real ice cream shakes, and more! Located in the Food Court at the Setzer Student Center. American Chinese food fresh from the wok, featuring their signature Orange Chicken plus healthy options with bold flavors and fresh ingredients. 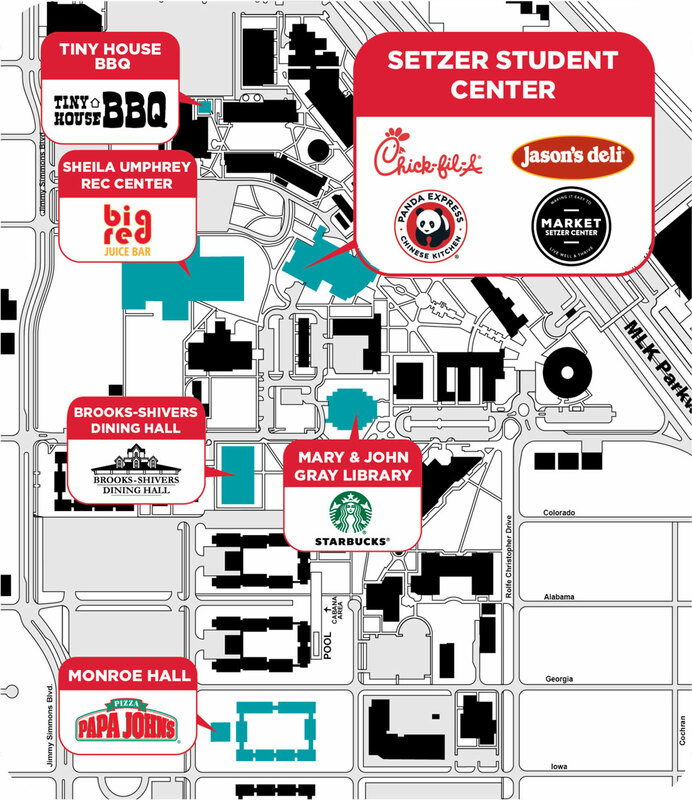 Located in the Food Court at the Setzer Student Center. Made-to-order sandwiches, wraps, paninis, salads, and fruit. Located on the first floor of the Mary and John Gray Library. Featuring specialty coffee drinks, teas, baked goods, and more. Located in the Setzer Student Center. Featuring Chobani yogurt, F'Real milkshakes, and plenty of quick-grab options! Located between the HHPC Building and Hayes Biology on the north end of campus. This location will satisfy all your barbecue cravings! Located between Brooks-Shivers Dining Hall and Mary and John Gray Library. Daily specials along with some LU favorites. Stop by the Recreational Sports Center to pick up a refreshing fruit smoothie, an energizing post-workout shake, or a frozen coffee treat. Located in Monroe Hall, Outtakes is a convenience store serving our on-campus residents and feeding your late-night pizza cravings. Visit Dining Services for Menus, Hours, and More!